Black Mountain College, An Experimental School | This Day in North Carolina History. 80 years ago Monday Black Mountain College was incorporated in Buncombe County, NC. Neat summary article here with some great photos. Today has been a slightly unusually productive day. I got a good draft done of my Bucky Fuller abstract which I’ll submit at the end of the month to the ReViewing Black Mountain College Conference. Additionally I got some good reading done in the Fuller essays. He definitely flirts with Positivism, and eschews Pragmatism (at least Peirce’s Pragmatism) to a great degree. I wonder if it’s possible that Fuller’s appearance on the scene at BMC in 1948 and ’49 signalled a much more radical philosophical break for the school– I mean, much more so than I anticipated. I’m looking forward to taking a closer look at the Josef Albers Papers when I’m back in Asheville this Summer so I can get a sense of where he stood relative to Rice/Drier and the other founding minds, who I have up until now assumed to have been more or less subscribers to Dewey’s Pragmatism. Another interesting note– in some background reading on the web today I came across some online materials from the Ramsey Library at UNC-A (which houses some BMC materials in their Special Collections Library) which listed Dewey as a member of BMC’s Advisory Council. So, that’s an encouraging tidbit. I knew there was a Dewey connection to BMC, but I wasn’t aware that it would be so clear or official as that. I was expecting something much more casual– an acquaintance with Rice, say. Hopefully there will be some letters to elucidate Dewey’s role as an Advisor there… Then again I suppose it is possible that his role on the Council was much more symbolic. After all he was nearing the end of his life and had retired from Columbia by the late ’40s anyway. A note on yesterday’s post, Hot Bones. That’s a true account of an episode from my stay with Yuco and her family a couple of weeks ago. Yuco’s Grandmother passed away suddenly at age 77, and I had the privilege of attending the various funeral ceremonies held by the family and community in her honor. The cremation was, admittedly slightly horrifying, however. The legendary Chinese General Sun Tzu’s words come to mind: “That which does not kill me can only make me stronger!” In any case, I hope that the tone of that story is reverent enough. A few of my asides (like the bit about Indiana Jones) are perhaps in questionable taste, though I think they convey my physical psychological and emotional states in the Bone Collection Room with fidelity. My apologies for not posting more photos more consistently. I’ve had pretty spotty Internet access from Yuco’s house, so uploading images has been a bit of a pain. If I make it out to my friend, Myia’s apartment tomorrow I’ll be able to do some of that uploading there, where I can use her LAN cable connection and much more reliable modem. In part due to Yuco’s Grandmother’s Funeral causing us to have to postpone our trip to Miyajima for the initial wedding planning meeting, I’ve decided to nix my plans to volunteer with WWOOF in Northern Japan. I think that will be for the best. I had some anxiety about outwearing my welcome at Yuco’s parents’ house. I will certainly want to ramp up my involvement in housework and so forth– doing all of the breakfast and lunch dishes, cooking a meal or two a for the family a week, and dusting and vacuuming the upstairs floor of the house where my room and Yuco’s room are. I have never felt unwelcome here. And so, after talking it over with Yuco and her parents, I settled on sticking around Kure for the duration of my time in Japan this Summer. Click here for more Info on BMC M+AC’s 4th Annual ReVIEWING BMC Conference, which, this year, is centered on the work of R. Buckminster Fuller. The Black Mountain College Museum + Arts Center, along with the Buckminster Fuller Institute and the University of North Carolina at Asheville, will present a 3-day conference exploring Buckminster Fuller’s Legacy, including his forward-thinking work during the two summers he was at Black Mountain College (1948 & 1949) as well as his innovative work in architecture, engineering and design science in the decades after BMC. In addition to panels and presentations, the conference will include an experiential Design Science Day held outdoors on the UNC Asheville campus on Saturday, September 29th. Papers, performances, multi-media and panel proposals in all relevant disciplines are welcome. Abstracts of 400-600 words should be submitted to Brian Butler ( bbutler@unca.edu) or Alice Sebrell ( alice@blackmountaincollege.org) by June 30, 2012. Notification will be made by July 15, 2012. The conference will take place in Asheville, NC Sept. 28-30, 2012. BMC Museum + Art Center’s New Info Page on the Jargon Society. The Jargon Society was founded by Jonathan Williams and David Ruff in 1951 in a San Francisco Chinese restaurant. Jargon 1 was a folded pamphlet with a poem by Williams (Garbage Litters the Iron Face of the Sun’s Child) and an etching by Ruff. Just 150 copies were produced. Jargon 2 was called The Dancer and consisted of a poem by Joel Oppenheimer and a drawing by Robert Rauschenberg. It was published at Black Mountain College soon after Williams’ arrival there in the summer of 1951. Other Jargon publications included The Maximus Poems by Charles Olson, The Neugents by David M. Spear and many others. Jonathan Williams provided early appreciation and an important publication outlet for now-celebrated writers such as Charles Olson, Robert Creeley, Denise Levertov, Robert Duncan, Mina Loy, Lorraine Niedecker, Kenneth Patchen and many others. One of Jargon’s most noteworthy titles was the publishing phenomenon White Trash Cooking by Ernest Matthew Mickler. Now celebrating its 25th year in publication with a special edition, White Trash Cooking has received rave reviews by a diverse roster of fans including the governor of North Carolina, the New York Times Book Review, cookbook authors and actress Helen Hayes. It continues to be Jargon’s top-selling title even now. Thomas Meyer, Williams’ partner, worked with him on Jargon projects for many years and has several books of his own poetry published under the Jargon imprint. Additionally, Meyer’s work as a poet and translator has been widely published and acknowledged for its precision and depth of feeling. His recent book Kintsugi has been nominated for a Lambda Literary Award. 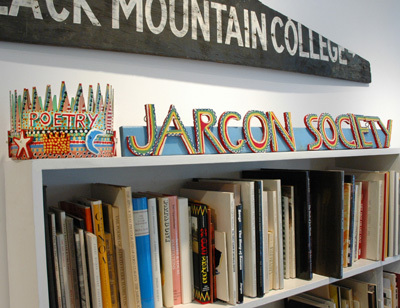 Image: The Jargon Society sign and Poetry Crown (both made by artist James Harold Jennings) now reside in the BMC Museum + Arts Center office underneath the Black Mountain College sign.